We thank you for your support!!! For the working man...this week has been a tough one! Not only is the action off the charts along the northern NJ beachfront, but the conditions are about as fly friendly as you can get! Do hear that noise? That is my head banging off the monitor!?!?! Talk about frustrating...especially when the conditions will go downhill big time this weekend when a huge storm is to develop along the coast with all sorts of wind and rain associated with it. Pictured to the right is a bait pod we came across last weekend that was comprised of some of the largest bunker I've ever seen this tight to the beach. At times it was all the way in the wash - almost beached - trying to get the hell out of the way from something. There were a few bass and blues on it...but we could not fool them on the fly. Liveliners got whacked a few times. Bait all balled up. This is what you hope for when you hit the suds. It was not meant to be on this day though. Now is the time we turn our attention to the salt. You have to put in your time to get a reward - - and that can be tough when you live multi-hours away. However, each year the thought of getting into a major blitz or that fish of a lifetime on the fly always gets us pumped to stroll the beachfront looking for those predators. 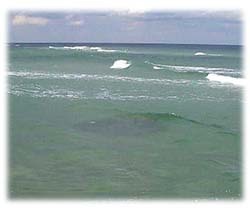 Right now the waters are still warm, and the bait presence has not been off the charts. There are fish being caught, but mostly by the guys putting in time with the meat stick. This time 2003 was hot! Now is the time to get out there!!! Perfect hour of the day for a cocktail! Lehigh notes...A must read is the recent Morning Call article titled 'Unleashing the Lehigh.' It ran last Sunday...Front Page! Talk about a comprehesive and fluid topic....pun intended - they did a great job though! The feature gives a fantastic overview of just about all the factors at play when it comes to Francis E Walter Reservoir management. 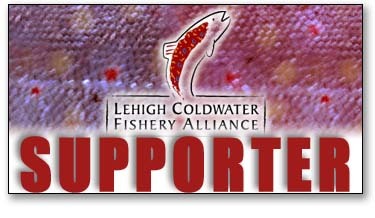 You can read the entire four-page article (pdf fromat) - graphics and all - on the Lehigh Coldwater Fishery Alliance website by clicking here. Slow...that is the word on the Lehigh from this past weekend. Even the other guides on the river concur. Water temps are now down into the high-40s-low-50s. Leaves have turned into a major league pain in the you know what! With the cold temps slow and deep was once again key. Except for an upcoming float stocking of fingerlings we are probably done with the Lehigh for the season. It is now time to move on to the salt! Looking back, we had some of best fishing ever on the Lehigh this past spring. Good flows, and great hatches produced many nights of rising fish. Definitely looking forward to next year!!! Contact us now to reserve your preferred dates. Working the slow water below Bowmanstown. On the Lehigh over the weekend there was a decent olive hatch - sizes 18-24...but despite all the bugs, only two risers observed all day. There was also a few caddis, some isos and iso spinners. Flow was on the high side - close to two-grand on the Lehighton gage - but very fishable via boat. Had to target slower water/eddies/pockets and you had to get your presentation down DEEP!!! 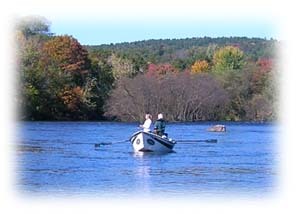 If ya wanted to just catch fish...the lehigh was HOT for smallies, with plenty coming to the boat...trout are spotty though, standard fall on the Lehigh. Leaves are about 60%. Next weekend should be 80%. 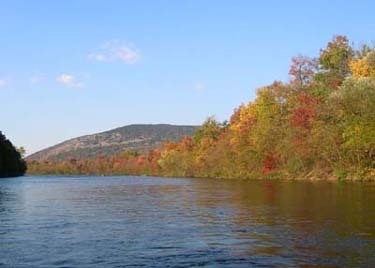 Looking upstream toward the Kittantiny Ridge from the Walnutport area. Going forward we have more trips coming up this weekend. It should be interesting what Mother Nature brings our way as there is talk of some pretty cold air and lots of wind.